Opened in 1964, Florida Atlantic University serves more than 30,000 students across seven beautiful campuses in South Florida. Among FAU’s 10 colleges is the College of Business, home to over 8,000 students, seven departments and an impressive offering of interdisciplinary and professional development programs taught by the college’s world-class faculty. The College of Business emphasizes innovation and entrepreneurism through practical instruction, real-life consulting opportunities, interaction with successful executives and research efforts conducted at its six centers. Headquartered in beautiful Boca Raton, Florida, and founded in 1964, FAU’s College of Business is accredited by AACSB - The Association to Advance Collegiate Schools of Business International, a recognition that only the top 5 percent of the world’s leading business colleges have earned. 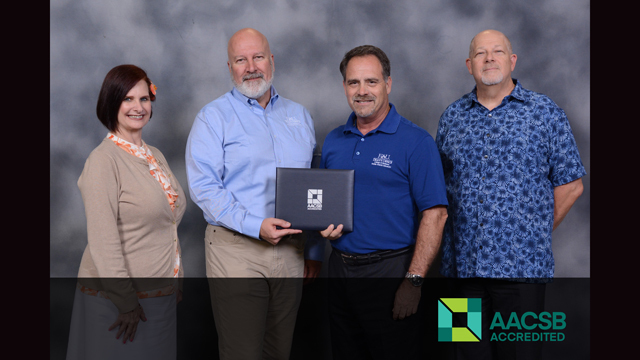 FAU is among the top-15 largest AACSB-accredited colleges of business in the United States, with a comprehensive slate of interdisciplinary and professional development programs. The FAU College of Business has been recognized by numerous media outlets, including U.S. News & World Report, which ranked FAU’s online graduate business programs 32nd in the nation in 2017, and Bloomberg Businessweek, which ranked our Professional and Executive MBA 27th among public universities in the nation. Named one of the “Best Business Schools” by The Princeton Review and ranked as the best business school for veterans in Florida by U.S. News & World Report, the College of Business strives to inspire students, faculty and the regional business community to innovate and make fundamental and positive changes to the way business is conducted. Please note that content shared or posted may be subject to Florida's Public Records Law. The University recognizes superior academic performance at the end of each semester by the publication of a Dean’s List for each college of the University. To be included in this list, an undergraduate student must complete a full-time load (at least 12 credits) with a grade point average of 3.0 or higher and must rank in the upper 10 percent of the students enrolled in the college. The selection of Dean’s List students is based on grades reported on the official grade reporting date for each semester. No changes are made to the list as a result of grade changes and removal of “I” grades. Grades of “NR,” “P,” “S” and “AU” are not used in determining eligibility for the Dean’s List. In recognition of superior academic achievement, the President’s List is published at the end of each semester of the academic year. This list includes the names of all undergraduate students who have completed 12 or more credits and who have attained a grade point average of 4.0. The selection of President’s List students is based on grades reported on the official grade reporting date for each semester. No changes are made to the list as a result of grade changes and removal of “I” grades. Grades of “NR,” “P,” “S” and “AU” are not used in determining eligibility for the President’s List. Find quick facts---from rankings to student profile information---about the College of Business. FAU's College of Business, an AACSB-accredited school, includes six departments that offer a variety of interdisciplinary and professional development programs and grant undergraduate, graduate and doctoral degrees. Explore the Boca Raton campus, home to 75% of our students, and discover the other campuses that serve the college. See how local Boca Raton’s businesses and entrepreneurs benefit from and collaborate with the college and its students. Enhance your FAU experience and expand your knowledge and networking with one of our student organizations. Planning a visit? Find directions, events and other information for your trip.